its true. Bubbletastic even. More on that later. We had another long weekend so the last update you had may have been a bit down but come Thursday lunch time I had that Friday feeling and it all cheered up from there. I went to knit night and was one of the last to leave requesting that the girls did not leave me finishing the last few stitches on my row, alone to the braying public that frequent the bar cafe at the forum. It was great fun as usual and I did a whole 5 rows of 456 stitches. WOOHOO! this scarf may just get done before Christmas. Friday I bimbled about, knitting and started sewing too. I cut out some skirt fabric and started pinning it all together. The other exciting thing we did was online shopping to arrive on Saturday morning. Hoorah for home delivery I loves it. spectacularly little else to report there. Saturday I drove over to Dad’s house and went a walk in the freezing horizontal hail which HURT when it hit you. We (me, dad, my sister, her husband and the two kids Ewan and Bethan) all went for a wonder around looking at stuffs, trying to decide if there was anything we could get in lovely Sheringham woolies. I did not manage to get anything but I wasn’t exactly looking hard for something particular. Dad rustled up a very tasty lunch and we all were happy. I stopped past my brother but did not stick around. They all have the lurgey and are falling to pieces. I drove home and did a little more sewing and whotnot. Sunday Scotty and I built a snowman. The whole weekend was snowy and wintry and lovely. Which made me want to make another hot and spicy curry. Which I did of course. Firstly after the food delivery I had lots of milk. I made my own cheese! It was very fun, just boil milk and whilst boiling and not boiling over add something sour. I used some yoghurt, you can use lemon but I’m not so keen on lemony cheese. Stir until all the curds come away from the whey. Put in some muslin cloth and squish! It worked very well indeed so I made Matta Paneer, Toor dhal, rice and Scotty made some dough for chapatis. I rolled them and we both cooked them. Ah we make such a good team when we get to cook together. Monday we went shopping and I bought NOTHING. *sigh* BUT Scotty did get some clothes for him and a two for £15 at HMV for blue ray DVD’s AND bought me lunch. So after doing a bit more sewing and relaxing after shopping we sat and watched WallE. I was not expecting to love it but I do. Oh yes, its a LOVELY movie and I would recommend it to be part of any family collection. The lack of words makes it suitable for anyone at all. So yes, a perfect weekend, a bit cold but so much fun. And then…..Monday night urgh. Bubble. I don’t know quite what happened to me but I ended up with a bubbly tummy like no other and queasy too. I had to go and sleep in the spare room upright. It was bad all day at work. Luckily only ending in burptastic style and not going south. I was worried it would be worse and last longer but it appears to be all fine now. One last thing, a big hug and lots of love to my big brother and his wife and the twins. 3 whole weeks of coughs, colds, flu, sickness and now burst ear drums and projectile vomit. I really do worry but I cant think of anything I can do to help except keep away and healthy…. Thank god I spotted that one before I sent it at work. Apologies, heavy moaning and groaning ahead. quietness has its reasons. The past week or even two or maybe right back to August I’ve been struggling. Feeling low and down and wanting to hide in a cuddly ball on the sofa safe with my knitting, my cats and even occasionally my husband. I really don’t feel like I’ve dealt with anything yet. Days pass by and I’m lost under a cloud of just getting things done and getting home and mooching. Feeling completely useless, lost and seeing no point in going out or achieving much. Its not a nice place to be because once I get in one of these places I tend to beat myself up about it. The reason I’ve been like this are two fold. ONE: yesterday was my mums birthday. I thought I could handle it but I rather did not. The other thing conspired against me so I took the afternoon off as holiday and headed back to my sofa hole to be supported by cat therapy. TWO: The pill. Playing about with your hormones is no fun ok. So if you want to take the pill remember your rational mind just may take a great big holiday and leave you lost in a darkened pit of despair. I’ve lost a lot of the nicer side of me, or at least it feels like I have. Constantly worrying can I cope each day with just the emotional strain of talking to my family, friends or even just chilling on the sofa trying not to let the nice little voices in my head go round in circles telling me off for being worried, then whacking me with a prime bout of PMT or stomach cramps that are bigger and more painful than they ever where. Add on to that I’ve been taking a chart of when my periods are, they have become more frequent, less predictable, heavier and just garhgh. Could I say any more to prove why I feel a complete mess? Anyway, because of messness, I did spend the entire** weekend holed up on the sofa yet again enjoying watching Scotty play fallout 3 and knitting studiously. This is at least the one outlet I am able to achieve and thankfully it mostly stills my mind taking at least one portion of it to concentrate leaving me with another portion to reason things out instead of being completely nutso. Believe me I’ve tried chanting again at times and even that is not working at the moment. This also means I nearly have a finished pair of yoga socks and I’m nearly half way through dad’s scarf which will take 3 times longer than a normal scarf… why did I do it? **ok I did achieve one thing. I cooked enough propper indian curry for two days worth of food. Last night after struggling with all of the above I moved early on to the new pill the doctor gave me. No way I am living through a further 12 days of depression and anxiety which may be partly due to the pill (i’m on my 4th month of the stuff). If this one does not work I’m just going to go back to normal and stop messing about with my hormones. This is mainly for my notes but the old pill was Micronor and the new pill is Cerazette. They both do different things and I am aware of how they go about them. I just hope I’m not causing damage playing around with my mental and physical being to be able to do *things* (*ahem* you know) only to find it kills all feelings for that sort of thing, which is so not what a newlywed wants. I find the biggest release is recognising the problem and just accepting it. Like yesterday, sometimes its ok to give up and go home and just wallow, the thing is, where is too much? where do I stop beating myself up? how do I find just the right way to deal with it all and be happy that I have, happy that I’m me and happy with the love I have, which I should be. I’m surrounded by a loving husband and family that I struggle to talk to. I adore them all but barely show it, I struggle to communicate it in any way but of giving them home made gifts and food. The issues of giving each other support but not bogging yourself down is a very very difficult line and I’m no where near finding any answers. I’m not sure if we’re all just a bit too tight lipped about it all and none of us have faced up to the fact we all have problems dealing with loss and adjusting. The stress of it all wears me out and I’m just hoping that getting it all down here is going to help in some small way. If not for me, or my family but for others who now know they are not the only ones out there who cant get that smile, don’t feel like they can relax and be honestly happy. I’m still happy little me inside, she’s just locked away deep right now and wants to come out and play but has lost her way and is sitting there crying for her mummy. Please feel free to make comment but do be aware this has upset me writing this, no more though than dealing with it in any other way. These things are something we all go through, well at least death of people close to you is. I don’t like decorating but I do love word-press on-line because a quick refresh of the site takes 10 minutes. Honest. I promise I spent no longer than 10 minutes of my *cough* Lunch break *cough* re-arranging and adding a new picture of Otis and Jasper. Well not a very new picture but one of the very few where they are attentive, together and can be chopped to fit. I would still like to do more but I enjoy the free services and really cannot be bothered with hosting and managing our own domain from our own little server at home. let me know what you think. I cant do much more without paying for some services. Quite limited but good enough for a tight wad like me. Is it just me or do all cat owners get slowly faster on the journey home (walking) because the closer you get the sooner you get to see your little darlings again. *sigh* I already miss the 4 day weekend and spending hours with one or other of them clamped to a leg. people have even commented this morning at work that I looked well rested. That’s because I did almost nothing! Babysitting, I went on my own and as Thursday night is knit night, I knitted and watched TV. It all went off without a hitch and the two darlings only coughed once and rolled back to sleep. I did not take any chances disturbing them. I since spoken to my brother and they had one of the worst nights for some time when one of them awoke at 2am, another at 3 and both stayed up till 4am.. Nice. Now tell me why I don’t have kids. Anyhew Friday and Saturday were cleaning days. We defrosted the slightly frozen over freezer. It went quicker than I hoped and it was well worth it. Other cleaning was done but I’m not saying what because its already a mess again and looks like we did nothing. Although the 7 piles of washing surely speak some towards what we achieved. The rest was spent knitting and playing computer games. Now I love lego batman but there is one kit we just cant get and that means we’ve let the game go. Its stuck in the middle of a no-repeat section of a level which is mighty frustrating. Instead Scotty has been playing fallout3 which I am finding a whole lot more entertaining than I thought I would. The fun starts right at the beginning when you get to choose your name as a child. There is a lot of hunting in dark corners for things, and most of the fights are not *BLAM BLAM BLAM BLAM* you get the idea. With the freeze framing technique it tends to break the fighting up enough for it not to be too intense, although the weird creatures that can sneak up on you are mighty quick and I have jumped out of my skin a few times. Thank goodness I don’t have to sew myself back in. I must state though, this is no kids games. I laugh at the gore but with an ewww look on my face when the slow motion playback follows a head that has been blown in to several pieces, as it rolls away. Amazing graphics, very macarbre and well worth it if you’re not going to get nightmares from seeing dead boddies lying around or even hung up a lot. Yes its a sick grim shooty game, but we’re amassing good karma and being nice and its fun to be nice in a nasty game. Oh yes. Saturday afternoon we went back to my brothers to spend the afternoon with the family. The aim was to go to the fireworks at £5 per car ish I think. Anyway we ate dinner and had some fun with the kids but decided not to stand outside in the cold and occasional rain. Instead we went and visited Erasmus. Now residing in powder form on mouse hold hill in Norwich we sat in our lovely warm car watching the fireworks go off all over Norwich. They were everywhere. We only stayed for about 10 minutes, got bored, drove home and settled in for the evening. Sunday I did the weekly, or in my case bi-monthly shop from tescooos. Goodies bought we then stayed in all sunday afternoon, evening and ALL Monday. We did not leave the house. One sunday roast and a loaf of bread made. Lots of relaxation, some knitting and lots of cat cuddling are what makes a very serene me. well after knitting for some time I produced one minor pattern some time back called the cable heart cascade. It was for socks but could be used on any knitting project from around 5 stitches wide if you cut out and use just one section of the pattern. Anyway, someone else asked about my beret and I thought it was about time I got sorted out and started hosting my items somewhere and having a place marker for them too. Finally I have done this and above on this site you will now see a new page tab called “free, from me to you“. One day I hope to populate it with lots of little how-to’s that I want to create. It may not be all that special but because it has been requested I wanted to create that little place just to share for free. I’m up for any suggestions of things to get in there to have it nicely populated. I’m thinking of recipes, pattern ideas, stuff that I can still call mine and individual enough that I’m not treading on any ones creative toes. I’m still not here to make profit but I would like to ask that if anyone does want to use my free items they consider donating what they would call a reasonable amount to pay for said item to cancer research UK. They were very helpful to my mum and dad throughout mums cancer and they deserve my support. to act like an emo kid. Not me! Tada! 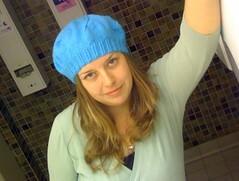 a beret that fits my huge head and expanse of hair. Im happy with it. There is one huge gaping mistake but I know where it is and there was no way I was going to undo and try again. I’ve had mention that I look cute and it suits my eyes. This is enough for me to wear it until it wears out. I’ve also started some yellow yoga socks for me. It makes it look like I’m never going to knit for anyone else but I will. I’ve just spent lunchtime with Dad and lovely though it was I have now committed to producing him a nice scarf before christmas. WHAT WAS I THINKING?? I do love him though so all other needles will be placed away until I get that done because I don’t think I can knit a whole scarf in the next month and a half. Last night our financial adviser popped over to collect papers and get them signed. I’m still a bit confused by it all.we’ve not chosen our mortgage yet because the current one we requested massively devalued our property. I understand its lost some value but not 30 grand in two years. I did a quick blip of research and proved my point. Anyway Scotty and I have a long weekend planned with Friday and Monday off work. Thursday night we’re off to babysit so our sister in-law can have a birthday dinner without the kids. I think we’ll be seeing the rest of the family for fireworks on Saturday night. Oits meowed like Charlie last night. Most amusing. You are currently browsing the Jiva a soul in transit blog archives for November, 2008.